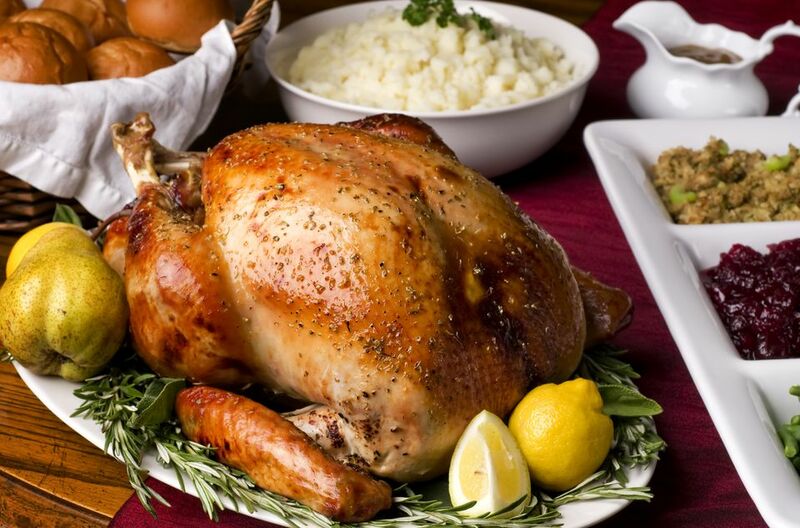 If you plan to spend your Thanksgiving in Oklahoma City but don't want to prepare a holiday feast at home, there are a number of restaurants that are open on Thanksgiving 2018. Many restaurants in the Oklahoma City metro area offer take-out holiday dinners you can order in advance and pick up on occasions like Thanksgiving or Christmas. However, if you'd rather skip the clean-up, finding a place that's open and serving on Thanksgiving can be a great alternative. There are some excellent restaurants open on Thanksgiving Day in the Oklahoma City metro area, and more and more are staying open each year. Calling ahead for reservations is recommended as spots tend to fill up quickly on the holidays, especially around peak dining times from noon to 3 p.m. and 6 p.m. to 9 p.m.
Bellini's Italian Underground is hidden at the bottom of the Waterford Building and offers Italian cuisine, wine, and cocktails. For Thanksgiving, Bellini's will serve a traditional holiday feast with turkey, dressing, and cranberry sauce (among other menu items). Favorites at Bellini's include crab crostini, fried calamari, chicken or veal picatta, baked salmon, and an 18-ounce grilled Angus beef ribeye with gnocchi and sauteed vegetables. This regular menu will not be available on Thanksgiving. The Bricktown Brewery at Remington Park is a multi-tapped, beer-centric restaurant with good pub food. They will open for their Thanksgiving buffet at 11 a.m.
Other Bricktown Brewery locations will not be open for the holiday, but the one at Remington Park will have an all-you-can-eat buffet featuring traditional Thanksgiving options alongside Bricktown favorites. You must be 18 or older to enter Remington Park. Located inside the Colcord Hotel downtown, FLINT serves up southern and midwestern favorites like hickory smoked brisket tacos, applewood smoked pork ribs, and masa batter fried Mississippi catfish. FLINT will be open normal hours with regular menus on Thanksgiving. They will offer a traditional Thanksgiving dinner special from 11 a.m. until 9 p.m. The special will include roast turkey, turkey gravy, sour cream mashed potatoes, cornbread stuffing, and garlic butter green beans for $28. Guests receive complimentary valet parking for up to 90 minutes. Specializing in Euro-American and German cuisine, Ingrid's might seem like an unusual choice for celebrating an American Thanksgiving. However, this Oklahoma City staple serves a special buffet for holidays, including Thanksgiving. They also offer complete holiday meals to go (order sheet). There are two locations for Ingrid's in the metro area: the flagship restaurant on North Youngs Blvd. and the location on North May Street. The Thanksgiving buffet is offered at the Youngs location only. News reports indicate the restaurant is up for sale so check with them before going. This long-running local favorite, Legend's Restaurant in Norma, will serve a traditional Thanksgiving meal by reservation only on Thanksgiving Day. The meal includes Roast Turkey and Glazed Baked Ham as the entree plus all the trimmings and dessert. It's typically recommended that you book your reservation at least two months in advance of the holiday, especially if you plan to dine with a large group. As of mid-October, tables were still available. The price for the meal will be $38 for adults and $13 for ages ten and under. This family-owned restaurant has been a staple of the University of Oklahoma community since it first opened in 1968, so you can enjoy some "down home" cooking at this rustic restaurant. This casual steakhouse has multiple locations in the OKC metro area, each of which will be open and serving burgers, fish, chicken fried steak, and a full kid's menu on Thanksgiving day. They will also be featuring a traditional southern-style menu of special items on a relatively inexpensive buffet, Mackie's is great for families traveling to Oklahoma City on a budget. Located inside the amazing 21c Museum Hotel downtown and featuring a special menu drawing from chef Jason Campbell's extensive New American cuisine expertise, you can enjoy a special creation for Thanksgiving. Mary Eddy's Kitchen X Lounge is a communal space perfect for a casual family dinner for the holiday. Mary Eddy’s dedicated entrance on Main Street welcomes guests into the original historic Model T showroom space where historical elements mingle with contemporary finishes and custom furnishings. While the original location at 10th and Penn was a staple of Oklahoma City, the new digs near Automobile Alley in Midtown make for an even better dining experience thanks to an upgraded kitchen, dining room, and menu. Locals and tourists alike have even said Nic's has the best burger in the metro area. Nic's features a special Thanksgiving menu for the holiday with lunch through dinner services. Located in a former gas station near Uptown 23rd, the Pump Bar is a good spot for cocktails and pub food but will also serve Thanksgiving turkey and specials throughout the day. The bar typically plays cult classic films on overhead flatscreens and there's a gaming area in the back featuring corn hole and other yard games. The Pump Bar has 16 local and specialty beers on tap and an extensive liquor and beer selection. As the name might suggest, the R&J Lounge and Supper Club has a nostalgic 50's style and ambiance, and they'll be serving Thanksgiving favorites alongside the regular menu on the holiday. You can enjoy fine dining atop the Devon Energy Center Tower at Vast on Thanksgiving Day this year, where typical menu favorites featuring seafood, lamb, and steak will be served. Throughout the year, Vast creates several special selections of entrees, appetizers, desserts, and drink pairings as part of their daily table menu, a three-course meal for a flat fee. Vast will be open from 10:30 a.m. to 2:30 p.m. for Thanksgiving dinner. The cost will be $49.50 for adults and $24.50 for kids 12 and under.